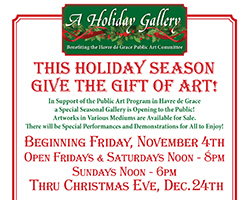 In support of the Public Art Program in Havre de Grace, a special seasonal gallery is open to the public. Special performances and demonstrations for all. Artworks in various mediums are available for sale.